PVDF plastic, also known as polyvinylidene fluoride or Kynar®, is a high molecular weight crystalline thermoplastic polymer. It exhibits excellent abrasion, chemical, and flame resistance and high UV stability. Upland Fab has been working with this unique material for years and provides precision machined PVDF plastic parts and components for all applications. This corrosion and chemical resistant plastic is very tough and durable, with good thermal stability in operating temperatures as high as 300°F (149°C). PVDF plastic offers high tensile strength and high impact resistance, and is easy to weld using thermoplastic welding technology. Polyvinylidene fluoride is available in homopolymer and copolymer formulations. Homopolymer PVDF plastic provides higher strength and stiffness and greater heat deflection than copolymer PVDF. Copolymer PVDF plastic is less stiff than the homopolymer variety, but offers greater impact and stress crack resistance. Both types of PVDF are available in FDA-compliant grades. The unique properties of PVDF plastic make it an ideal material for a broad range of uses. Common applications include chemical tank liners and process equipment, semiconductor components, pipe flanges, fittings, seals, and gaskets, among many others. To ensure precision and accuracy when machining PVDF plastic parts, we utilize multi-axis machining technology. Our CNC machining capabilities enable us to maintain tight tolerance in complex geometries, and ensures perfect repeatability from the first part to the last. Minimal time is required for handling and fixturing, and in many cases highly intricate parts can be completed in a single operation for quick turnarounds. DPD/MBD processes (Digital Product Definition/Model-Based Definition) allow us to machine polyvinylidene fluoride parts directly from your CAD models. Using your digital design files helps eliminate errors and enhances precision and efficiency. This results in higher quality, lower cost parts. Good communication is crucial in any project. That’s why, when you work with us, you’ll have a single point of contact throughout the entire process, and you’ll receive consistent, reliable updates that will keep you up to speed on your project’s progress. 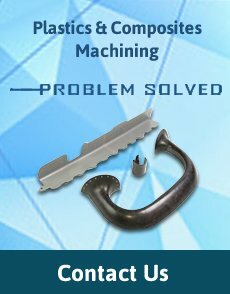 We are industry leaders in PVDF plastic machining. Request a quote to start your project, or contact us to learn more. Since 1970, customers throughout Southern California have turned to Upland Fab for top-flight plastic and composite machining. Contact us for more information, or request a quote to get started on the PVDF plastic parts you need.